Come and have fun at Peppa and George's spooktacular Halloween party! There's plenty of pumpkin pie for everyone! 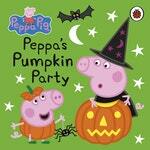 Love Peppa Pig: Pumpkin Party? Subscribe to Read More to find out about similar books.